Emory Healthcare has apologized for “a breakdown in communication” with the family of A.J. Burgess, 2, whose kidney transplant has been delayed by Emory University Hospital (EUH). The apology followed a five-hour Thursday meeting between Emory Healthcare officials and physicians; A.J. Burgess’ parents, Anthony Dickerson and Carmellia Burgess; the Burgess’ and Emory Healthcare’s attorneys; former Atlanta City Councilman Derrick Boazman; and some Candler School of Theology students. The Healthcare representatives included Emory Healthcare CEO Jonathan Lewin and Professor of Surgery Christian Larsen, who is a part of the child’s transplant team, according to Boazman. “In reviewing our communication with the family, Emory Healthcare wants to acknowledge and apologize for a breakdown in communication on our part,” a Nov. 2 Emory Healthcare statement sent to the Wheel by Interim Associate Vice President for Health Sciences Communications Holly Korschun reads. According to Boazman, Emory Healthcare had not communicated adequately with the family about the requirements for the father to donate his kidney. EUH had delayed the child’s transplant operation from Oct. 3 to January 2018 at the earliest because Dickerson had violated his parole, according to the Atlanta Journal-Constitution. EUH told the child’s mother in a letter that Dickerson, a willing, living donor and a perfect match for his son, could not donate his kidney until he showed proof of compliance with the terms of his probation for three months, according to the AJC. The family fears that delaying the operation until January might be too late to save their child, who undergoes daily dialysis and was rushed to the emergency room Sunday due to an abdominal infection. EUH has declined to provide specifics on the case, citing patient confidentiality. Following this past week’s protests against Emory Healthcare and prayer vigils for the child, about 60 Emory affiliates, including a group of students from Candler School of Theology, and community members marched Thursday afternoon from Asbury Circle to the hospital in protest of EUH’s decision to delay the child’s transplant. “Shame on Emory and shame on us,” protesters chanted during the march. 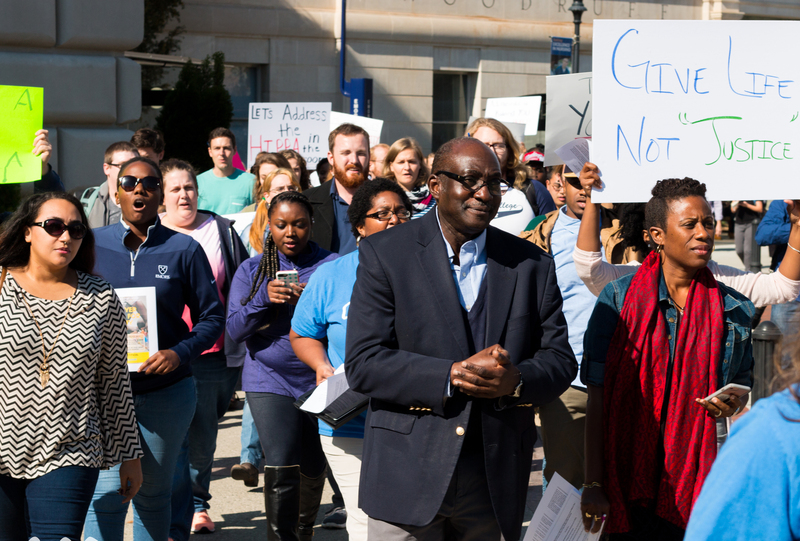 Some of the protesters, including Boazman, demanded and eventually were granted a meeting with Emory Healthcare officials Thursday afternoon. During the meeting, the Healthcare team and family agreed to meet again on Nov. 6 to further discuss how to move forward with the child’s treatment, and established that they held a mutual goal of helping A.J. 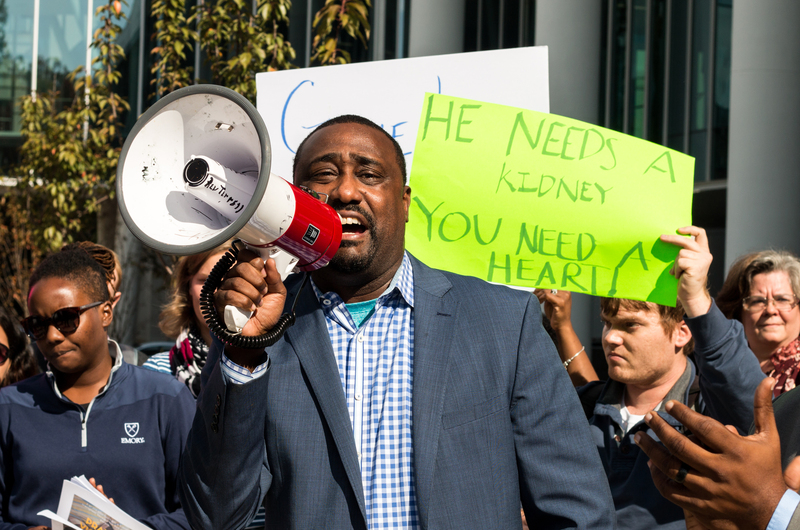 “[Emory Healthcare] made a commitment that this [transplant] process will restart on Monday,” Boazman said, promising that if Emory Healthcare failed to communicate with the family on Monday, that protesters would return. The child, who was born prematurely and without kidneys, is on the general donor list for a kidney, according to Boazman. In an earlier Nov. 2 statement from Lewin released before the end of the meeting, Lewin wrote that Emory Healthcare wants to work with Dickerson to help him become a kidney donor. EUH is following national guidelines for organ donors, Lewin wrote. “When evaluating any potential donor, Emory’s medical team is required to consider the ability of the donor to manage the many complications and health challenges that come with a major surgical procedure,” Lewin wrote. The family has hired attorney Harold Spence, who did not respond to request for interview. Korschun said she could not say how Emory intends to work with the family by press time.